We discussed Avanti Feeds about a year back at Rs 35. The stock has been a multi bagger backed by very strong growth in revenues and profitability and is currently trading at Rs.145. The reason for change in fortunes has been due to introduction of new variety of shrimps – Vannamei. Earlier Black Tiger variety was being produced which had lower density and hence higher cost of production.Vannemei is more remunerative for the farmers now. It was encouraging to go through the FY 2012 Annual Report of the company. The undertone is very positive and as per it, Industry is expected to continue growing at 20- 25% for next 2-3 yrs. Avanti is aggressively expanding its capacity in anticipation of the demand. Thai Union Frozen Products PCL (TUF) holds 25.12% equity stake in the company. Mr.Wai Yat Paco Lee has been appointed as a director representing TUF. TUF is one of the largest seafood exporter company in the world. The overall Shrimp culture was very encouraging and rewarding for the company. Its the second consecutive year where the overall increase in the shrimp culture both in terms of water spread area and density of culture was by around 25%. The main reason being shift from Black Tiger shrimp cultivation to Vannamei shrimp cultivation. The improvement in the international prices for shrimps has also encouraged new farmers in taking up the shrimp cultivation. Strong sales growth by 125% in the Shrimp Feed segment. The processing and export division sales increased by 58.4%. It is the most preferred brand by the farmers due to maintenance of high quality and constant technical support to the farmers. The dividend has been increased to 65% from 10% last year. The industry has had a poor past till 2008 but the recent changes in the industry are very strong and augurs well for the good players. Avanti Feeds is one of the biggest and perhaps the most efficient player with a significant tie up with worlds largest Seafood company Thai Union Frozen Products. TUF holds 25% stake in the company. If the industry is to maintain 20-25% growth for next few years then Avanti has a good opportunity to capture a good business and make the most of it. We feel that the stock has potential and monitoring of performance is needed. I’m sure you all must have realized my enthusiasm about the long term prospects of BKT by now. Post the management meet and latest annual report of the company, I think the company is on a very good wicket to deliver consistent growth for next 3-5 years and achieve its internal target of $ 1 Bln turnover & 10% Global Market share by 2015. Your company operates is predominantly known as “large variety-low volume” – a segment that restricts optimal capacity utilization. It is a capital intensive as well as labour intensive proposition, making it un-attractive for fresh investments by major players. Your Company is fully geared up to take advantage of the peculiarities of the said segment and has developed a large base of SKUs to meet the diverse needs and applications. Company has already set up an all-steel OTR Radial tyre plant at its Chopanki location and thereby become the first company in India to set up such plant. If you get interested in a company and you read the annual report, you will have done more than 98% of the people on Wall Street. And if you read the footnotes in the annual report you will have done more than 100% of the people on Wall Street. Recently the official websites of the stock exchanges have started providing the soft-copy of the annual reports for downloads. As the same has begun from this year itself, thus not all the annual reports are available on the websites, but the same is expected to be made available for most of the companies as the time elapses. At present the annual reports are available for about 30% of the companies. 1) Using BSEINDIA website: Search for the stock on Bse India >> Select Annual Reports from bottom right corner (where the snapshot of financials is given) >> Select your annual report. 2) Using NSEINDIA website: Search for the stock on Nse India >> Select Annual Reports from extreme bottom of the page >> Select your annual report. To make it easy for you we have set up a small application which searches for the annual reports both at BSE India and NSE India as well as other sources and provide the download link 🙂 . Also, the search feature on both the above sites (BSE and NSE) is too buggy; to solve the same you can search for any part of the name OR even the script code (eg. 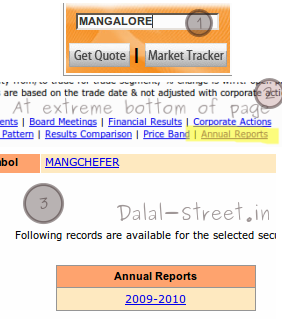 532701 for BSE Listed Company or MANGCHEFER for NSE Listed Company) on Dalal-Street Screener. 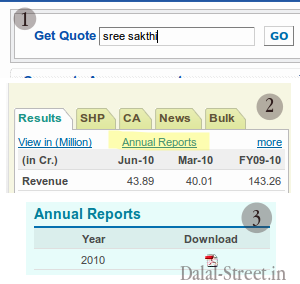 Do share any other site if any which provides free annual reports through comments. Also please leave your feedback for Dalal-Street Screener or any queries through comments. PS: Earlier the link for the above web-application was http://reader.dalal-street.in. The same has been moved and integrated with our Screener app to provide even better functionality.